When Irish people want to have a good time, they head for Galway. Tiny in size but huge in character the city of Galway typifies that laidback, chilled attitude the West of Ireland is known for. Galway’s charms are best enjoyed by strolling the city lanes and soaking up the atmosphere. The past lingers in the air here. Traces of old Galway, including the city walls and the distinctive Spanish Arch, give the city an ancient atmosphere. Follow the salty air that breezes through the winding lanes to traditional shops and pavement cafés. Shaped by its status as an important seaport, you'll find plenty of seafood on the menus. The traditional Irish music session is the ultimate ‘Irish’ experience. Quay Street has the best selection of live traditional music in bars such as The Quays, Tigh Neachtain and The Spanish Arch Hotel Bar. In Monroe’s Tavern in the heart of the city, there’s free entertainment every night of the week so if you want to experience a genuine Irish trad session and maybe join in for a jig or two, you’re in the right place. Walking tour of the city - by taking a guided tour, you’ll get the insider knowledge. You’ll visit most of the city’s iconic sights including Eyre Square and the Spanish Arch. Shop for some traditional Celtic jewellery - did you know the world-famous Claddagh Ring was first designed in Galway? Check out the history of this romantic ring at Thomas Dillons jeweller which tells of pirates, lost love and great romance. Sample the delights of the Atlantic ocean washed down with a nice cold pint of Guinness - each September, Galway City comes alive with seafood & oysters as it celebrates the Galway International Oyster & Seafood Festival, the most internationally recognised food festival in Ireland and the world's longest running International Oyster Festival. Experience a medieval church - packed with curious corners and ancient tombs, Ireland’s largest medieval parish church, St Nicholas’s Collegiate Church, was built in 1320. 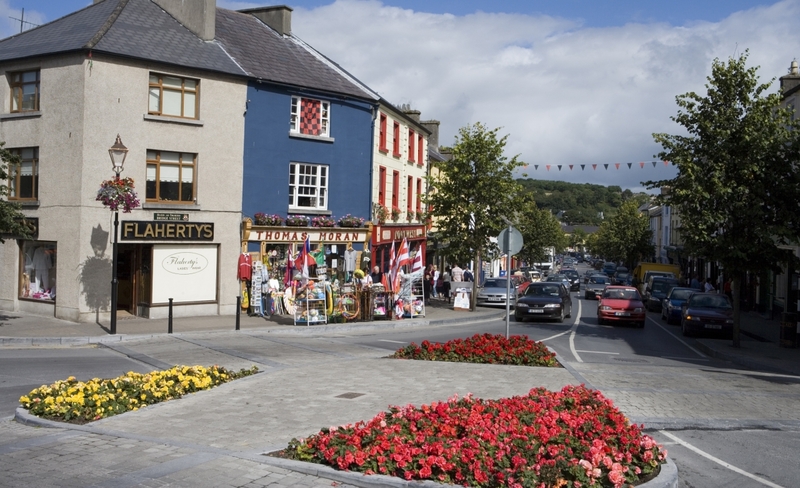 Visit the Galway Farmers Market – the market can be found every weekend by St Nicholas' church. Visitors will find hundreds of stalls selling fresh produce and locally produced crafts. Visit youngest of Europe’s great stone cathedrals - the colossal Galway cathedral was first dedicated in 1965 and displays an interesting mix of Renaissance, Romanesque and Gothic characteristics. Inside columns shoot up into the ceiling, transforming into curved arches that support a gigantic dome. Just a short ferry ride from Galway Bay, this trio of cultural and historical hubs - Inis Mór, Inis Meáin and Inis Oírr - represent the rugged west of Ireland and the last lands to the west before you reach North America. With winding roads, historic ruins and cosy pubs, the islands are a little slice of Irish heaven. They have a romantic aura with stone walls, prehistoric forts, wind-battered coastlines and pristine beaches. They're also famous for the chunky Aran sweaters designed to battle the tumultuous winter weather. The ideal destination for a day out in majestic Connemara at any time of year. Located about an hour’s drive from Galway City, the dramatic landscape and iconic image of a gothic castle reflected in a Connemara lake has made Kylemore Abbey world-famous. Its magnificent six-acre walled Victorian garden is governed by a strict rule: every variety of plant growing within its walls must be one that was cultivated by Victorian gardeners. This is one of the wildest, most enchanting and culturally rich coastal touring routes in the world. Wherever you travel along the Wild Atlantic Way you’ll find magic, adventure, history and beauty in abundance. The Mayo to Clare section, which includes Galway, can be enjoyed with our five day itinerary or, if your time is limited, you can select one of our recommended day trips from Galway below. The Connemara Film Trail takes the traveler to film locations around the region, which is famous for its dramatic and rugged landscape. One of Ireland’s best loved films The Quiet Man (1952) was shot here and the village used for ‘Inisfree’ was Cong, in south County Mayo. It now boasts a Quiet Man Cottage Museum, which is a recreation of Sean Thornton’s thatched home, and a replica of Pat Cohen’s Bar, which screens the movie on a daily basis. 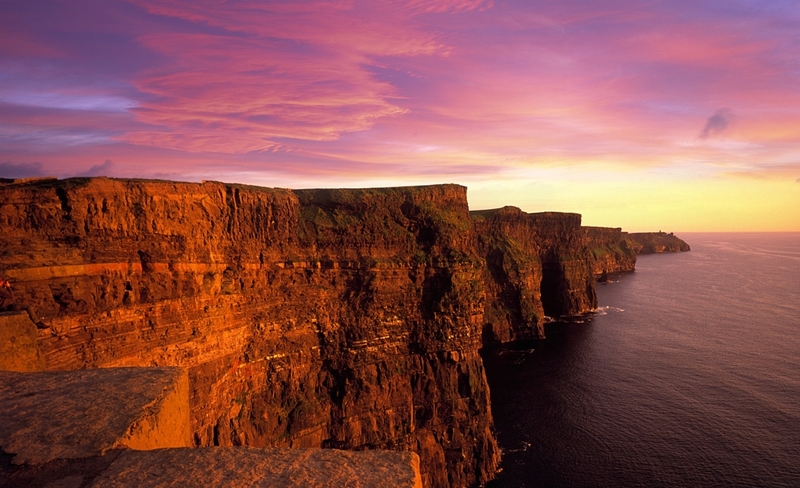 Cliffs of Moher – soaring 393 feet above the Atlantic Ocean to their maximum height of 702 feet. 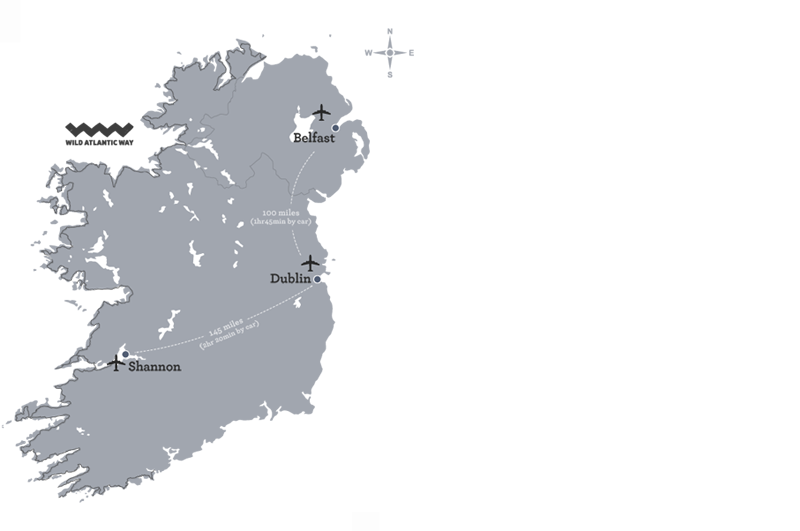 There are over 1,968 feet of pathways and viewing platforms along the cliff edge, offering great views of the Aran Islands, Connemara’s Twelve Bens and Galway Bay, and even as far as Kerry’s Dingle Peninsula. Cruise the Cliffs – take a 1 hour trip from Doolin to experience the mighty Cliffs of Moher from sea level. Learn about the many seabirds of the area and marvel at the giant sea stack, the 230 feet high ‘An Bhreannan Mór’. Explore The Burren - an ecological and geological wonder, a guided tour will show you the amazing flora and fauna of the region, including an orchid that only blossoms here. Climb Croagh Patrick - Ireland's holiest mountain's religious significance dates back to even before Saint Patrick is believed to have fasted here for 40 days. Now, each year, thousands of pilgrims climb the 2,500ft mountain. Magnificent views of Clew Bay from the top await those who reach the peak. Discover Westport - Westport House and Gardens is one of the island’s most historic homes and is open to the public. Visit the National Museum of Country Life – the exhibition mixes the old with the new on the grounds of Turlock Park House in County Mayo. In contemporary galleries, see how Irish people lived in the decades between the Great Famine and the 1950s.